Interview with the interim Executive Director of Manavi, which is at the forefront of providing culturally appropriate solutions to alleviate domestic and gender-based violence. 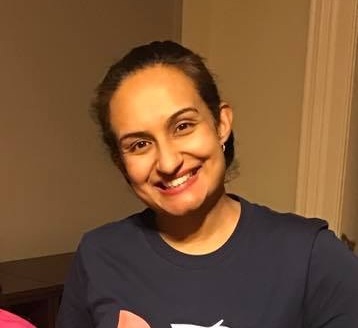 While domestic violence transcends all racial, ethnic, gender, and socio-economic boundaries and impacts all communities, Navneet Bhalla feels that South Asian survivors face unique challenges, including cultural and linguistic barriers. Bhalla currently serves as the Interim Executive Director at Manavi, an organization striving to address the issue of gender-based violence, advocating for the survivors and also pre-empting it through awareness and education. Prior to her Manavi role, she practiced as an attorney in the United Kingdom for a number of years and gained extensive experience in immigration law, human rights law and employment law. Bhalla, who is fluent in Punjabi, Hindi, Urdu, Farsi and English, has worked on employment and discrimination litigation, traveled to Sudan as a legal consultant representing the International Rescue Committee (IRC). She has also lived in Tehran, Iran, for a number of years, enabling her to help affected women overcome linguistic barriers. In a conversation with American Bazaar’s Contributing Editor Venky Raghavendra, Bhalla talks about her journey, her passion to address gender-based violence and the upcoming plans for Manavi. Venky Raghavendra: What motivated you to get involved in the work of Manavi? Also share with us your vision for the organization in the next 3 to 5 years? Navneet Bhalla: I’ve always been committed to human rights and women’s rights. As an attorney in the U.K., I practiced human rights law and represented hundreds of immigrants from various South Asian and other countries, including a significant number of women and children impacted by violence and fearing persecution. I was inspired by Manavi’s mission to end all forms of violence against women as domestic violence is a violation of women’s human rights. Over the past 32 years, Manavi has done extensive work to empower women and to raise awareness about gender-based violence in the South Asian community. I am motivated to get involved in order to protect women’s human rights and empower victims of injustice. It is important that we advocate for social change now. Today, after 3 decades, Manavi continues to be a pioneer in advancing the South Asian women’s movement. In the next 3-5 years, my vision for Manavi includes an expansion of services and broader outreach, so we can continue to support more women. Manavi will also strive to have meaningful impact on policy, address how institutions respond to domestic violence and how they could better serve South Asian women. In addition to providing culturally specific supportive services, Manavi will also expand our programs to focus on prevention of domestic violence and sexual violence. Overall, my vision for Manavi is to continue to build stronger partnerships and collaborate with different agencies and institutions to take a multi-faceted approach. Raghavendra: Earlier you worked on policy issues through South Asian Americans Leading Together (SAALT) engaging in policy advocacy, for immigrant rights and social justice for South Asian Americans. Manavi is particularly focused on South Asian women and addressing various forms of violence in this particular community including the policy front. Do you see any parallels or stark differences as to how this issue affects this community versus the rest of mainstream American society? Bhalla: Domestic violence transcends all racial, ethnic, gender, and socioeconomic boundaries and impacts all communities. Gender-based violence has a devastating impact on women, regardless of their backgrounds and it destroys individual lives and communities. However, South Asian survivors face unique challenges, including cultural and linguistic barriers. Specific challenges for South Asian survivors include gender powered dynamics and deep-rooted patriarchy that exist as a “cultural norm”. In addition, the role extended family members play in perpetuating violence against survivors present unique challenges for South Asian survivors. Immigration status is also a serious concern for South Asian survivors. Many women are trapped in abusive marriages as their spouses threaten to jeopardize their immigration status as part of the vicious cycle of domestic violence and the power and control that is exercised. This dynamic in South Asian communities is further compounded by the fact [that] there is a hesitancy by South Asian survivors to contact law enforcement due to mistrust and/or lack of culturally appropriate and linguistically accessible services. Transnational abandonment is another issue wherein many South Asian survivors are abandoned in South Asia, or the U.S. without any communication or resources by their spouses, who they are dependent upon for their financial and social survival. To exacerbate the situation further, the cultural stigma attached to abandonment and a broken marriage results in South Asian survivors being isolated and unable to seek the support and resources they need. At Manavi, we recognize the challenges faced by South Asian survivors, hence we have always focused on providing culturally specific and linguistically appropriate services. Raghavendra: Do you see the #MeToo movement as a watershed moment for the issue of violence against women? Has Manavi been able to leverage this larger focus on the issue and if so how? Bhalla: The #MeToo movement embodies empowerment. It has empowered women and survivors to come forward with their stories. To a large extent, it can be seen as a watershed moment in how we as a society respond to violence and inequity towards women. This #MeToo movement is part of a larger movement with historical context following other “watershed moments” in the fight against gender-based violence. For decades, efforts to end violence against women have been ongoing. As advocates, our focus will remain on whether this movement can change the lives of the masses of women who are impacted by violence in the home and continue to be left behind in our society. In light of the current #MeToo movement, we certainly have the potential to make meaningful impact, however it will require us all to collectively continue our commitment to address gender-based violence in a broader context. It also means we must continue to create room for dialogue on the intersection between gender and race. It is important to address how women of color, including South Asian women, are impacted by culturally specific factors surrounding domestic violence and sexual violence and how patriarchy and culturally accepted gender roles must be challenged. Raghavendra: Do share with us more about the “annual dinner” that is coming up? What do you hope to achieve including any specific goals you have set for the event? Ms. Bhalla: We are very excited about our Annual dinner that is coming up on Saturday, April 21, at the Mirage Banquet Hall in Edison, New Jersey. Details can be found on our website at www.manavi.org. Our annual gala is attended by over 300 women and men in our community and it raises funds to support South Asian survivors of domestic violence. The funds raised go towards advocacy, counseling, crises intervention, safe home (Ashiana) and empowering women. We have an entertaining evening lined up with music and dance performances. We are excited to have our keynote speaker, the Honorable Raja Rajeswari [Judge of the Criminal Court of New York City] join us to share remarks along with our special guest, Honorable [New Jersey state Attorney General] Gurbir S. Grewal and hosted by the prominent television anchor Joya Dass. We also need South Asian men to step up alongside South Asian women and be part of the movement as we collectively address gender-based violence in our community. Raghavendra: Do you have any message for young men and women in the South Asian community about their attitude towards the issue of violence against women? Bhalla: Culturally, there is a gender bias that needs to be addressed. This disparity is partially based upon cultural norms and patriarchy and how gender roles are defined, including the power and control that is exercised. When we talk about empowering women it is more than just giving opportunities. It is also about changing how communities work, it involves changing laws and policies and most importantly investing in strong women’s rights organizations and movements like Manavi. Young South Asian men and women are the new generation and part of the #MeToo movement now. This is part of a larger resurgence of the women’s movement. We need both men and women to be mobilized, step up and take action to collectively address domestic violence and sexual violence in our community. Cultural trends are difficult and slow to change. Self-development is in our own hands. All four must be developed comparably to each other and integrated with each other for one to be competently empowered.